Many people use the Internet to look up weather information to answer questions like "will it rain today", "is the sun shining at our holiday destination" or "do I need to take a jacket with me". What most do is open the website of their favorite newspaper, or the website of a popular weather portal, to get weather information for the day and a forecast for the coming days. The free portable application sWeather has been released as part of Donation Coder's fundraising event in March. 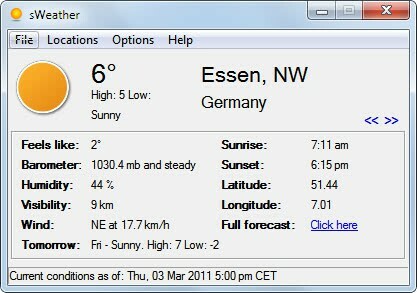 The application has been designed to display local weather information in the Windows system tray and the program window. It is therefor a handy alternative for users who look up weather reports regularly on the Internet. Configuration is a little bit complicated, as it uses WOEID information used by Yahoo Weather. A WOEID, or Where On Earth ID, is used by Yahoo Weather to determine locations in the world. Users therefor need to enter a place's WOEID to get local weather reports for that location. To do that they need to visit the Yahoo Weather website and enter their location or zip in the form near the top of the page. The last part of the url of the page that displays the weather information on Yahoo is the WOEID. The WOEID for New York is 2459115. This ID needs to be entered for every location that the user wants to access weather reports for. Locations are added in the configuration which is accessed via the Options menu at the top of the program window. Users can add as many locations as they want provided that they have the WOEID at hand. The local weather app uses non-metric units by default which can be switched in the options as well. The app displays the local weather report of one location at a time, with the option to switch between all configured locations with the mouse (click or mouse-wheel) or keyboard shortcuts (left, right or up, down). Weather information are detailed and include different information next to the location's current temperature. Among the information are a weather forecast for the next day, the "felt-temperature", the humidity and wind strength. The application window can be closed without losing access to the weather information. The system tray icon displays the current temperature and current condition in icon form. It is not possible to switch locations if the app is minimized. For that, it would need to be opened again with a double-click on the system tray icon. Interested users can download the sWeather application directly from Skwire's Empire over at the DCMembers website. The program is portable and should work on most editions of the Windows operating system. It was tested on a 64-bit Windows 7 edition. While it looks nice, I prefer to use the FF add-on Forecast Fox, for all my weather needs. Please, add proxy configuration option with user/pass too.